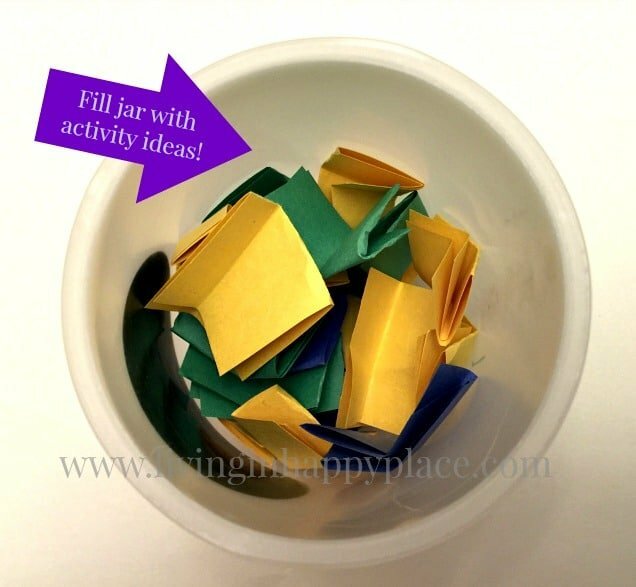 Preview: Keep kids busy with a bunch of play suggestions using this Kids Activity Idea Jar! My daughter is only 3 and she is already saying it. Should I worry? That seems young to be bored 😉 I try to keep her busy with a Montessori playroom set-up and a plethora of activities but she is very indecisive about what to do. I agree that letting children “be bored” encourages creativity and imagination but sometimes she just needs a little help. 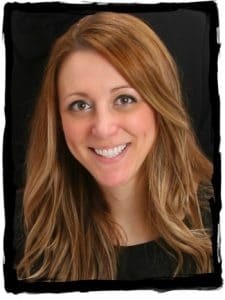 I want to share with you an idea that has been working for over a year now! 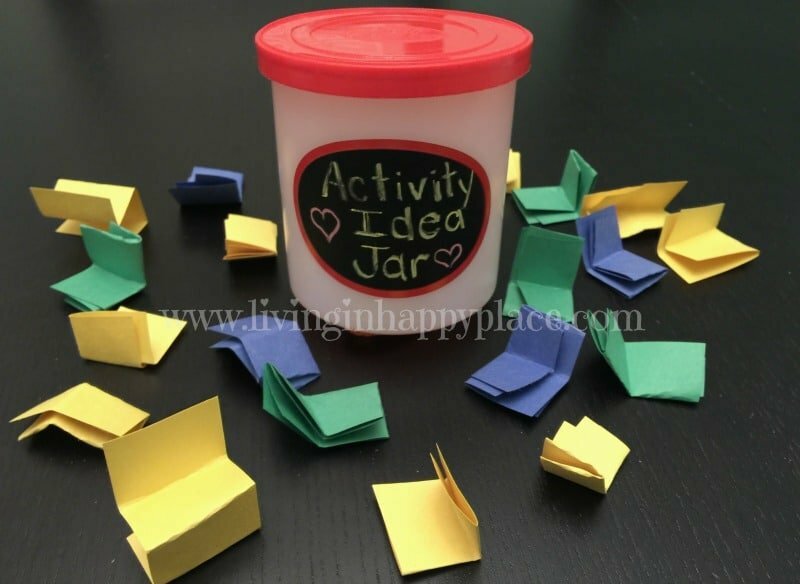 I assembled a Kids Activity Idea Jar to help pick an activity that she can do herself or we can do together on those days when even I am not sure what to do next. I love that it gives me an excuse for Mommy & Me activities. It is simple to make and has been a lifesaver when I need to cook dinner or work from home! I used different colors of paper to represent the weather. The BLUE papers are rainy-day activities (I use the blue ones as special places such as the museum, bounce places, Chuck E. cheese, etc. and they pick one the night before), the GREEN papers are outside activities, and the YELLOW papers are anytime activities. This way we avoid the disappointment of pulling a “Go to the park” activity when it is thunder storming! You can add/remove as necessary to make sure they are able to pick an appropriate activity. Take colored papers and write weather appropriate activities on each. Fold and put into jar, close he lid, and shake it up! Add the chalkboard label and call the jar something like: Family Time Activities, the I’m Bored Jar, Fun Things To Do!- anything you’d like. 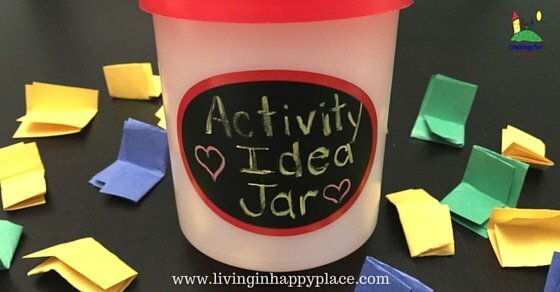 This kids activity idea jar has been such a big hit that she often brings me the jar and says “Mom, I’m bored” just as an excuse to pick an activity. Parenting win. Anytime she find a new favorite activity, we add it to the jar. It also comes in handy to find an activity she and her sister can do together. I can cook without having to try not to yell and they can have fun without watching TV or asking for iPads! 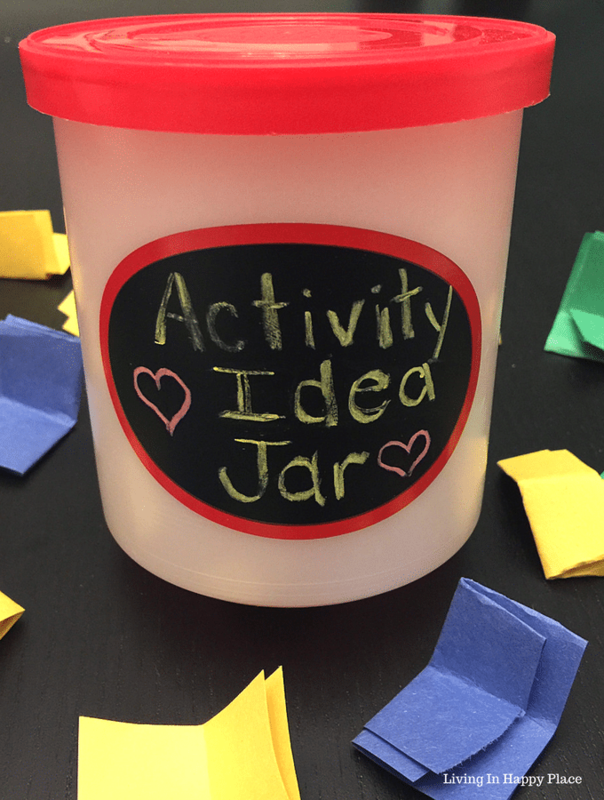 What will you add to your kids activity idea jar?